You’ve seen photos of the ancient Acropolis, dating back to the 5th century BC-now’s your chance to see it in person. You’ve watched the Olympics on TV-now’s your chance to visit Olympia, legendary home of the first Olympic Games. You’ve dreamed of cruising in the Greek Islands-now’s your chance to sail into the deep-blue waters of the Aegean Sea and visit these islands yourself. All of this and more await you on this budget-minded Greece tour and cruise. 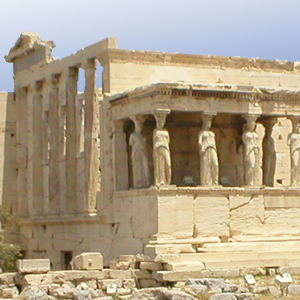 Step back in time on your guided visits to many of Greece’s historic sites. In addition to the Acropolis, visit the archaeological site of Mycenae, dating back to 1350 to 1200 BC; the amazingly well-preserved, 2,300-year-old open-air theater in Epidaurus, which still seats 14,000 spectators; and the medieval Byzantine Citadel of Mystra, a castle founded in 1249. Also visit the spectacular landscape of Meteora with its 24 rock-top monasteries set in almost inaccessible sandstone peaks. You’ll also enjoy a 4-night cruise on the Aegean Sea cruising to some of the world’s most beautiful islands. Visit Mykonos, Greece’s most famous cosmopolitan island with its seafront village, sandy beaches, and whitewash houses; Kusadasi, Turkey, where an included excursion takes you to the fascinating Roman, Greek, and Byzantine excavations of Ephesus; Patmos, where St. John the Divine wrote the Revelation; Rhodes, one of Europe’s largest medieval towns with ramparts and palaces built during the Crusades; Heraklion, Crete, nestled picturesquely between two mountain ranges with archaeological treasures and beautiful scenery; and Santorini (weather permitting), still an active volcano offering one of the world’s most breathtaking panoramas. Picturesque fishing villages, breathtaking islands, and ancient sites offer a sightseeing vacation of a lifetime. Your budget travel to Greece for a spectacular Greek tour and cruise is truly an affordable dream vacation!